DESC is working on a new affordable housing development in the North Rainier neighborhood, located at 1911 22nd Avenue So. Our plans include construction of a new building, starting in Fall 2018. 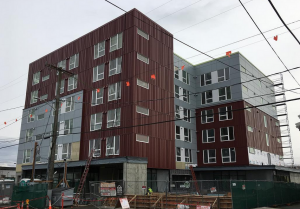 When complete, the new building will feature approximately 90 studio units of affordable housing with supportive services and indoor/outdoor community spaces for people who are disabled and formerly homeless. DESC will continue to own and operate the building after completion. In addition to housing, DESC’s future plans for the site include an integrated physical and behavioral healthcare clinic to be developed separately. It will serve residents of the supportive housing and the broader community, and create new employment opportunities in the neighborhood. Update: Since our community meeting last summer, DESC has arranged to purchase the small adjacent parcel on the corner of 22nd and Plum that will improve the overall design of this project. The project will continue to be a two-phase project. The first phase will be built on the north portion of the parcel, providing 85 affordable studio apartments with supportive services and indoor/outdoor community spaces for individuals who are disabled and formerly homeless. Construction of the first building will begin in the spring of 2019. The second phase of the project will be built on the corner and include the integrated physical and behavioral healthcare clinic and approximately 92 units of affordable housing for people with disabilities who have experienced homelessness. This second building will begin construction in early 2020 and be completed in early 2021. DESC will own and operate both buildings and provide management and supportive services to the residents of the housing. The healthcare clinic will be jointly operated by DESC and a primary healthcare provider and will serve residents of the supportive housing and the broader community. Both the clinic and the housing will create new employment opportunities in the neighborhood. Click here for a copy of the community notification letter about the meeting and flyer is available here. We will update this webpage as the project proceeds. Interested in learning more? Contact Daniel Malone, Executive Director, at dmalone@desc.org, 206.515.1523.